Glen Strathfarrar is one of Scotlands best kept secrets and is one of the three glens in the Strathglass area which include Glen Affric and Glen Cannich. Birch and Caledonian pine border the lower reaches of the River Farrar, giving way to old farmlands, derelict crofts and drystane dykes. 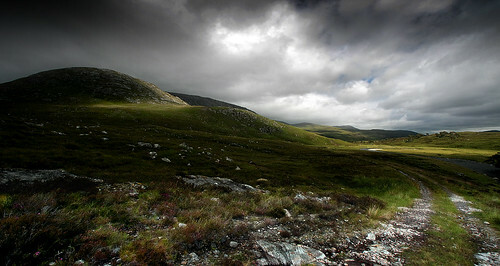 Further up, the glen opens out to open moorland with mature Scots pine studding the unspoilt hills. Entering a narrow gorge you cross over a hydro dam and come out onto the Eastern shores of Loch Monar ringed by the Munro peaks with the lonely deer forests of Pait and Strathmore beyond. Access to the Glen is restricted for motor vehicles to the annoyance of some but walkers and cyclists have no such problems. Photographers preparing to travel the 17 miles up this private road should first of all check the access times and in Winter bear in mind that there would be no snowploughs to help them out in poor weather and no mobile phone signal to call for help. 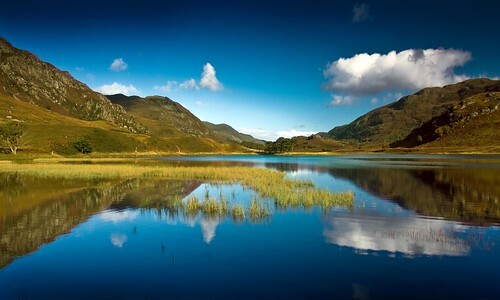 The beautiful Lochs, Beannacharan, Mhuillidh and Monar stretch out along the River Farrar under the ever present Sgurr na Lapaich at the Western reaches of the glen are your reward. One of the first and finest views you come across after travelling through the woodland that follows the River Farrar is the view to Sgurr na Lapaich across Loch Beannacharan. 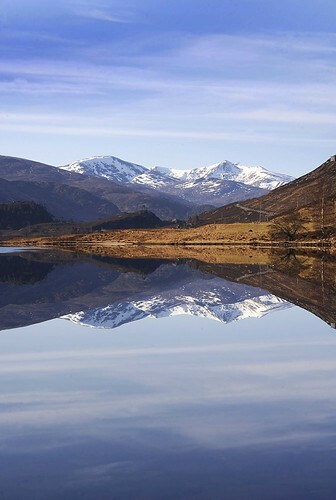 If your lucky and the weathers right, the surrounding hills offer wonderful reflections. 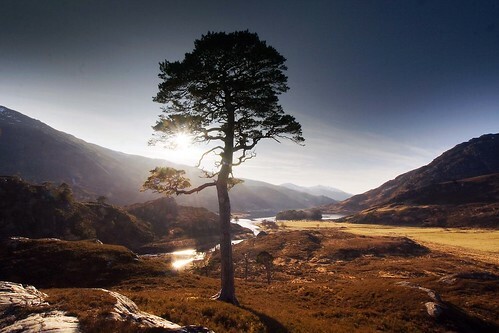 As you carry on through the glen you come across a lone Scots pine atop a small hill which can be accessed with sturdy waterproof boots across some boggy moorland. The first time I walked up it I found a wee plastic box with a pen and notebook among the roots of the tree. It was put there by the partner of someone called “Pauline” who had laid her ashes there..” A beautiful spot to rest” and invites people to reflect on the view and on there day. It’s been replaced by a new notebook now but if it’s still there, respect the idea, have a look and write something down. 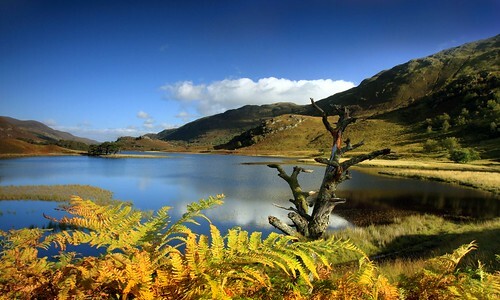 The Loch of the Mill provides some stunning locations from it’s Eastern shore. As you travel along West you’ll come to a derelict farmhouse and a walk around this area provides some of the best views Strathfarrar has to offer. 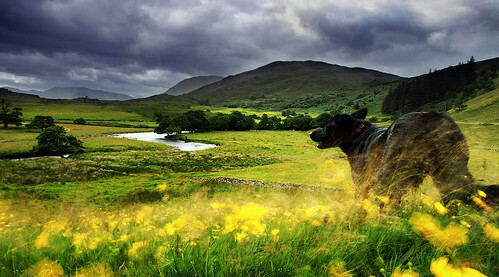 In Summer, the fields come alive with wildflowers. The meandering river winds it’s way through the glen and old stone walls provide excellent lead in lines. And In Autumn…arguably the best time of year to visit…the hills come alive with sound of the deer rut and fantastic reds, greens and yellows to complete the scene. Further West you come across the Braulen estate. Red deer are extensively farmed here and there are plenty opportunities for grabbing some shots. I however, am not a wildlife photographer and lack the patience…much respect to those that do…Here after, the landscape becomes more rugged and the mountains begin to close in until your at the foothills of the wonderful Sgurr na Lapaich. Wild camping is not encouraged in the glen and the restrictive opening times really limit what is available but in the shorter months you may be able to catch the sunrise and sunset. Definately no light pollution! From Inverness head out North toward Beauly and go on to the A831 toward Struy, just before you reach Struy you will see a sign on the left leading to Strathfarrar. Before a locked gate you will find the gatekeepers cottage. If you have checked your access times…knock and wait…but if your on foot or bike you can carry on! 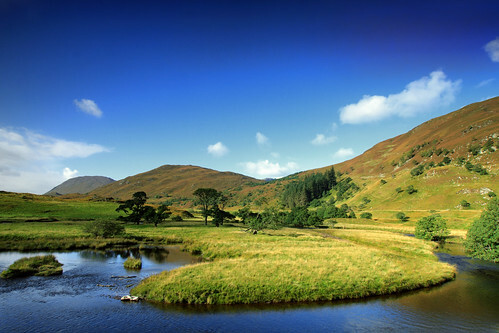 The nature and landscapes of Strathfarrar are one of the gems of the Scottish Highlands and can easily be reached from Inverness. For further information on accomadation and local amenities click here.